IBEW Local Union 953 has over 1,600 members in western Wisconsin, northern Illinois, Iowa, Minnesota, and the UP of Michigan. Our goal is to represent all electrical workers in our jurisdiction. 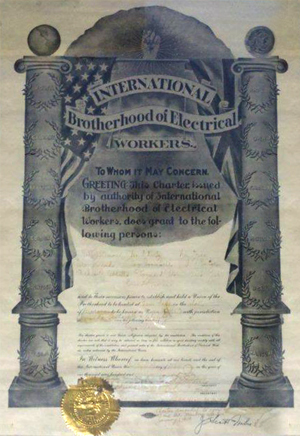 International Brotherhood of Electrical Workers (IBEW) Local Union 953 received its charter on May 26, 1919. IBEW Local 953 represents approximately 1,600 members comprised from Xcel Energy, Dairyland Power Cooperative, 14 distribution cooperatives, 12 municipalities, as well as line construction, tree trimming, manufacturing, CATV, and telephone companies . Our objective today is the same as when the IBEW adopted our constitution more than 100 years ago. The number one goal nonunion workers strive for is to make a better living and secure a better future for themselves and their families. We deliver this to our members through organization, education, and motivation. Organization was desperately needed when there was a widespread abuse of workers. It remains important today, even with legislation that protects the rights of workers. Union workers have a better future than nonunion workers. Since 1891, organizing has been the cornerstone of IBEW's existence and is an important building block for our future. We will continue to focus on organizing every member of the electrical industry in our area, building upon the strong momentum established in recent years.